Made in a special paella pan; hearty and delicious. Check paellapans.com. Chefs Karan Fischer and Lisa Davies. 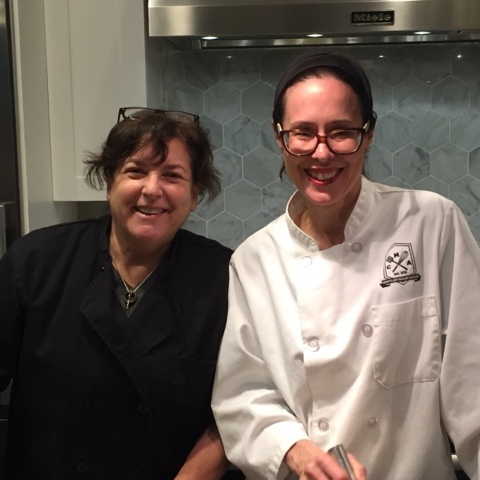 I was invited to join the Montclair Culinary Academy for another cooking class tonight, and it was fun. 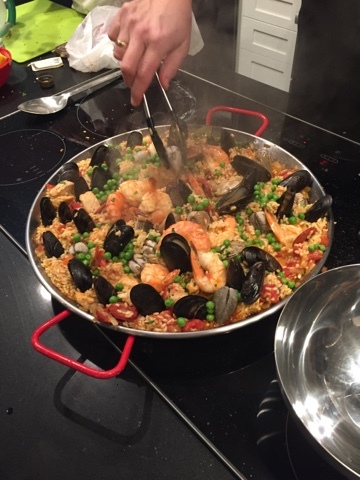 Chefs Karan and Lisa led a group of us in making a huge pan of delicious paella with chorizo, clams, mussels, shrimp and chicken and dainty little cups of crema catalana, a Spanish custard with burnt sugar top, similar to crème brûlée. Go to Amazon to save shopping legwork. Lisa ordered the delicate saffron threads for the paella through a Spanish food supplier online. Casserole dishes, and mothers, matter. Lisa had a fish pie cooling in a clear glass Pyrex dish and it exploded; you can't use Pyrex if it has a tiny chip or crack. And: Oldies are goodies. My mother was an amazing cook from Hungary, said Karan, who worked as a sous chef and on the grill at Gramercy Tavern in NYC. I use all my mother's Corning. Use fine wines for cooking. Don't buy junky wine to cook with and good wine to drink, said K. She likes a nice pour to add to bouillabaisse or sip from a glass. And same goes for olive oil; get best, cold-pressed extra-virgin for everything, from dipping bread to cooking. The chefs have heard lately about Italian olive oils getting cut with other oils, to fool us, and suggested buying good Greek or Spanish brands now. Remove bay leaves before serving. There were three dried bay leaves in the paella. Take them out before serving, because they can be a choking hazard, especially for children, said L.
Make cooking fun. A meal like this is very casual, said K. I don't like a lot of stress. I learned from my mom that you can love a lot of people with your food. Had coffee with Pats. It was her idea to choose a time and she'd drink her coffee in Colorado and I'd drink mine in Montclair, and we'd catch up. She is two hours behind us. Walked to and from Java Love [about 50 minutes round trip] with laptop to write. Making good progress. Going to the cooking class was relaxing and it was nice to meet the other women. By the time we sat down to eat, we had gotten to know each other better and were discussing everything from movies to kids, and more personal matters. Bonding over food. Fabulous! I think I'll try a paella for my next big family dinner. That sounds great, Nan. I think paellapans.com may have recipes too. Do you have a favorite recipe? Hope all is well. Thanks for the tip on recipes. I have a shelf of cookbooks which I'll also browse. 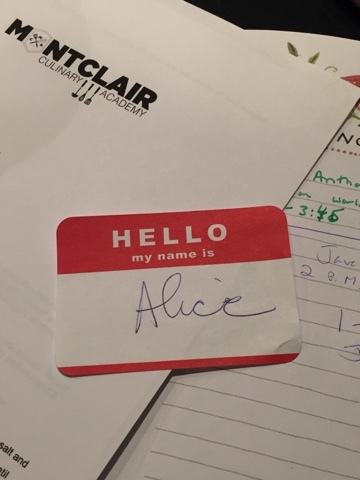 Thank you so much Alice for joining us! Hope to see you soon! It was fun. You know, it was cold and dark, and I felt like nesting, but once I arrived I was so happy to be there! Good company and great food. Thank you.